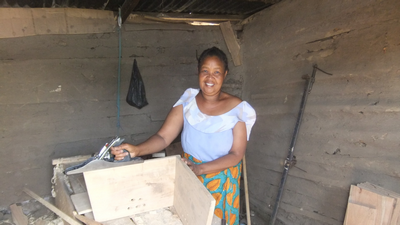 Anna is one of the longer standing beneficiaries of the Grants & Loans scheme, having received an initial grant in 2006. The wood cutting business she ran then, evolved in 2010 into a furniture making operation. She has a steady trade in small wooden items for the home, storage boxes etc. Although usually a man’s trade, Anna has always maintained that if a man can do it, so can a woman! In parallel, Anna breeds chickens and has a steady trade in selling eggs and chicks. One of the most resourceful of our grants recipients, Anna had taken out several loans to expand her business and always paid them back on time. The latest one, was used to buy stocks of good quality timber and additional tools. Anna looked after her mother until she died, aged, 90 last year. She has five children, the eldest of whom, Abdoulie, is just completing a three year degree course at Dar-es-Salaam university. Anna is one of the first of our recipients to have sent a child to university, which is a great triumph for the family. She is the first to admit that, without the funding from Mondo, and the guidance of the local team, she would never have been able to provide the support for her family that has made this all possible. If you would like to help support more women like Anna, we are currently raising funds for our next round of grants and loans. To help us achieve our target you can donate here.